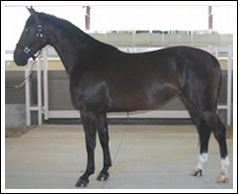 Zegna FR is a beautiful black filly by Sandor-Jane, the 2003 USDF National Champion Mature Stallion, and out of the 2003 USDF National Champion Broodmare, Raquel DG. Zegna (pronounced Zein-ya) has three lovely gaits and correct conformation, and a pedigree filled with the highest KWPN predicates. With her super temperament and picture perfect beauty, Zegna is sure to standout in the show arena!